Salesforce likes to tout its marketshare lead in the CRM space, and peppers its advertising messages with the graphic below. However, this data tells us more about the broader customer experience landscape than about Salesforce itself. The underlying data comes from IDC, which is a reasonably reputable source, but remember that all marketshare data is suspect, especially if the markets are fragmented, fungible, and characterized by a plethora of privately-held vendors (more about that below). 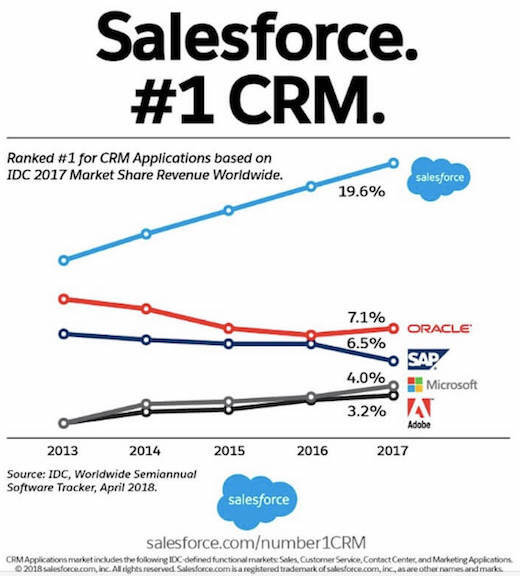 More importantly, the fine print notes that the data also includes non-CRM technology, such as marketing platforms — that's why Adobe's on the chart, even though they don't sell a real CRM. The chart should then include IBM, which offers a sizable slate of marketing technologies, and it will tend to under-weight SAP and Microsoft, who do not. So, the graphic is misleading. Surprise, surprise! Even if we presume this data relates primarily to CRM, the next most interesting take-away is that among these major vendors, they only make up 40% of the market. That's intriguing, because, compared to other MarTech segments, the CRM market has relatively few global players. 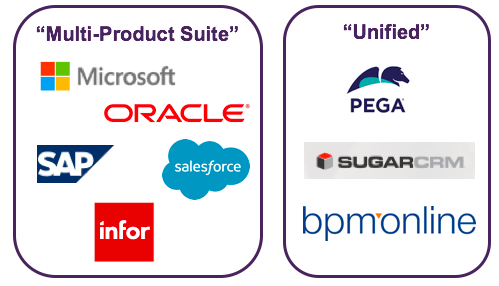 RSG evaluates eight major CRM vendors head-to-head. But a lot of CRM-type services get delivered via more generic business management suites, especially for small to mid-sized enterprises. That last trend is just starting, and will impact many technologies, but particularly CRM. If you're thinking about licensing Customer Data Platform technology, check out RSG's hard-hitting evaluations of the key players in the CDP market.